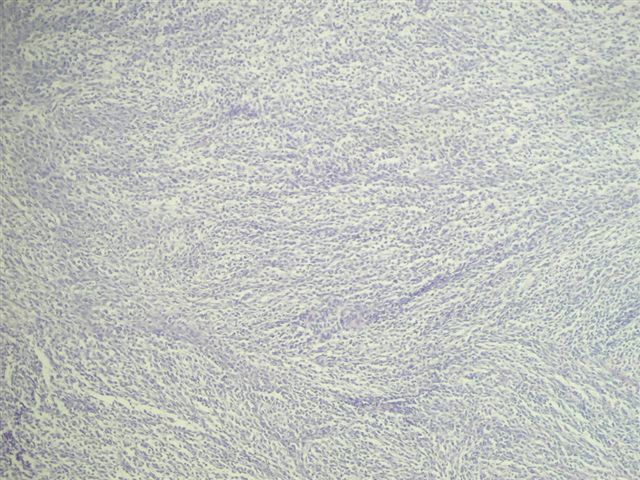 A 40 year old woman had a radical nephrectomy for a �large renal mass.� The kidney weighed 488 grams after removal of perinephric adipose tissue.� The upper portion of the kidney contained a 10 x 9 x 9 cm mass of grey-white solid tissue with central cystic and mucoid degeneration.� No golden yellow or hemorrhagic areas were noted.� Focally, the tumor formed nodules abutting onto the renal pelvis, 0.5 cm from the renal hilum.� The adrenal gland was grossly normal. 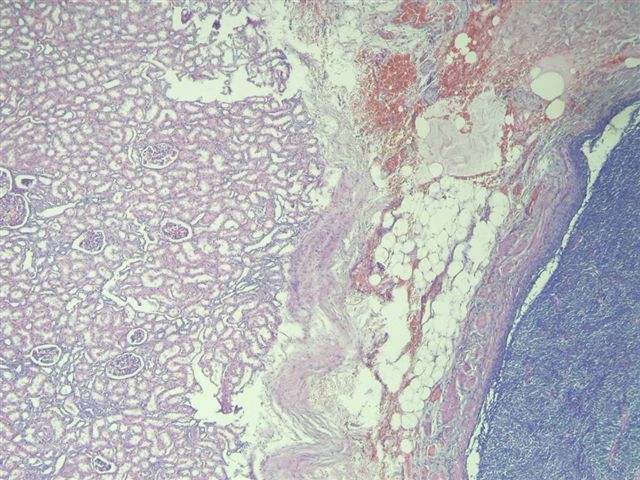 Additional sections showed mitotically active cells, but no neoplastic glandular tissue.� No bone or cartilagenous foci were present.� The tumor extended into the renal pelvis and within large venous channels.� It was adherent to but did not infiltrate into the renal capsule. 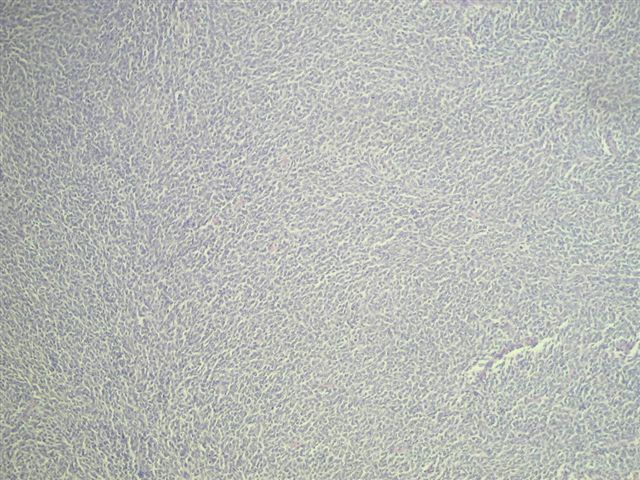 The tumor was immunoreactive for vimentin, CD99 (O-13) and Ki-67 (15-20% of cells).� The tumor was negative for lymphocyte markers CD45, CD20 and CD3; keratins CK 7, CK20 and pankeratin MNF-118; neuroendocrine markers NSE, chromogranin A and synaptophysin.� It was also negative for desmin, smooth muscle actin, CD10 and c-kit/CD 117.� Cytogenetics or molecular studies were not available. 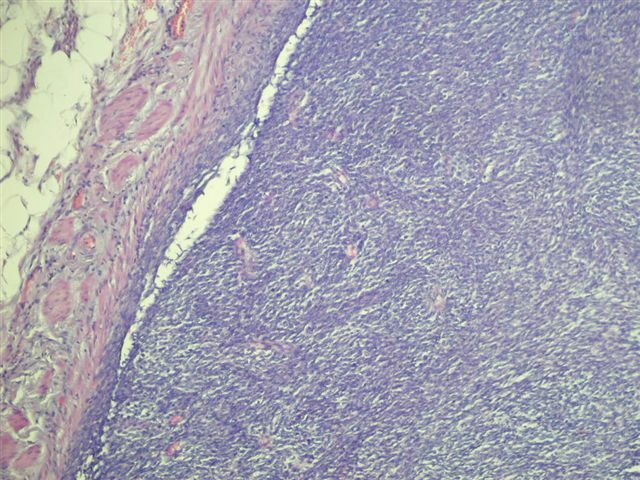 Synovial sarcomas are typically found in the extremities of young adults, with less than 30 cases reported in the kidney since 1999.� In the kidney, the median patient age is 35 years, range 20-59 years, with no gender preference.� They are usually large, partially necrotic masses, with grossly noted cysts in 70%.� Histologically, they are usually highly cellular and monomorphic, composed of short intersecting fascicles of plump spindle cells.� The tumor cells have indistinct cell borders, minimal cytoplasm, ovoid nuclei and �inconspicuous nucleoli.� They infiltrate around native, non-neoplastic renal tubules that undergo secondary dilatation, which may simulate a biphasic pattern.� They often have a hemangiopericytoma-like vascular pattern with staghorn vessels.� Cystic spaces are lined by hobnail-type cells with eosinophilic cytoplasm and apically oriented nuclei.� Renal synovial sarcomas may rarely exhibit rhabdoid features (AJSP 2004;28:634), be biphasic (with epithelial cells), or have small cell or high grade spindle cell features.� Immunostains are helpful in excluding other spindle cell tumors.� Synovial sarcomas are immunoreactive for vimentin and CD56, with variable staining for CD99, bcl2 and EMA.� They are typically negative for keratins, S100, CD34, smooth muscle actin and desmin.� Over 90% of cases demonstrate t(X;18)(p11.2;q11.2), which produces the SYT-SSX2 (also SSX1 or rarely SSX4) transcript that is specific for synovial sarcoma (figure 3-karyotype #1, #2 (tumor of arm), case report).� These tumors appear to have aggressive behavior. 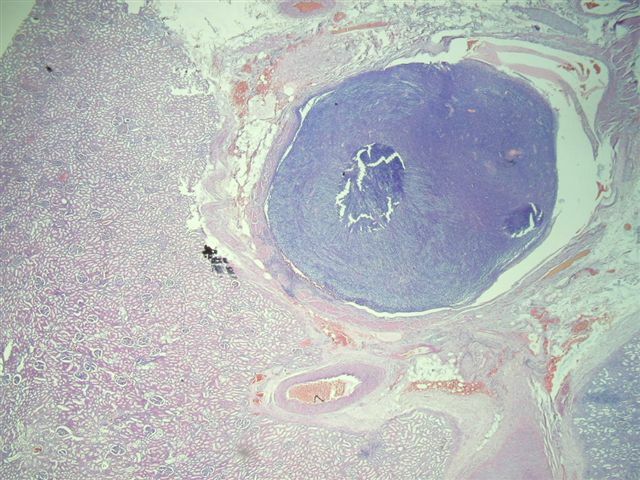 The histologic differential diagnosis includes other spindle cell tumors of the kidney, all of which are negative for t(X;18), although some synovial sarcomas are also negative for this translocation.� Of particular concern is the relatively common sarcomatoid renal cell carcinoma.� It typically affects older patients, with a mean age of 60 years.� Its malignant epithelial component may be focal, so adequate sampling is important.� The epithelial component is keratin+ and EMA+, and the sarcomatoid component is often EMA+ and S100+.� Another histologic mimic is cellular mesonephric nephroma, although almost all of these patients are newborns (up to age 1 year), and tumor cells have more cytoplasm and are desmin+.� The differential also includes two CD34+ tumors: hemangiopericytoma (less cellular pleomorphism and no/rare mitotic activity) and solitary fibrous tumor.� Blastemal variants of Wilm�s tumor are spindled, but often have serpentine or nodular patterns, and are immunoreactive for WT1, in contrast to synovial sarcomas, which are WT1 negative.� Finally, Ewing�s/PNET may appear similar, although they usually have primitive round cells with variable rosette formation, instead of short fascicles of spindled cells, and have a characteristic t(11;22)(q24;q12) translocation.